Nucleon BizApp Studio is an high level application design and development software without or less coding. It supports data editor forms, user controls, reports, charts, tables, chross tables, scripting and other application components. Data Forms are allows you to CRUD (create, edit, update, delete), search and view data using HTML based editor forms. It provides form designer and viewer where you can design data editor form with its data editor controls (textbox, datatime, numeric, image etc.) and edit the data using this form. It allows only RDBMS (MS Acess, Oracle, MySQL, PostgreSQL, SQL-Server etc.) to create, read, update and delete data. NoSQL database systems currently are not supported. 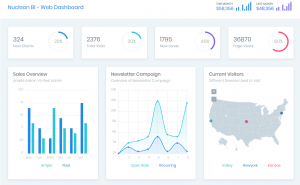 BI Studio provides an easy to use dashboard designer and powerful dashboard components. Explore your data quickly: Build visualizations with an intuitive UI and rich components. Deliver complex information with dashboards: Translate information from your various corporate systems and data into visually rich presentations using reports, maps, charts, and other graphical elements to show multiple results together. The reporting module is a key capability within Nucleon BI, a single product that provides complete business intelligence reporting capabilities on a proven and modern architecture. 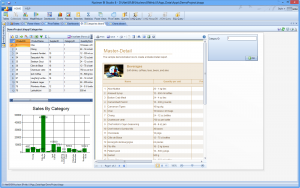 It enables you to design queries, create flexible and feature rich data reports, charts, data-grids and cross tables. 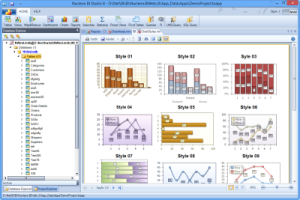 The reports can be easily exported to MS Excel, Word, Open Office, PDF, XPS, XML, HTML, CSV and Image formats. 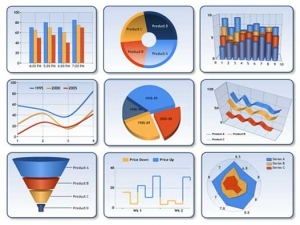 BI Studio provides powerful and rich charting components for data visualization and visual chart designer. It supports both, 2D and 3D charting and line, spline, area, pie, point, bubble, stock and float bar chart types. An unlimited number of chart areas, titles, legends, and annotations as well as data series and data points are possible. 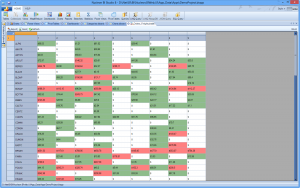 The charting component moreover supports data copying, merging, splitting, sorting, searching, grouping, and filtering. With binding technlogy you are able to bind your data to the html components and visualize on the desktop and web. Nucleon BI provides OLAP Cross Table features for easy visual data mining and analysis: The Cross Table module provides MS Excel-like tables (Pivot Table), engineered for multi-dimensional data analysis and cross-tab report generation. Cross Table has the power to visualize hard to read and difficult to dissect dataset information into compact and summarized visual reports. Data Source Explorer: View and Export Tables, Views or Collections.